Encrypting the password before string to the database, it’s more often that if there is plain string there is chances of hack your system by Hackers. It will be tough for them to crack it if the password is looking like weird charter symbols. 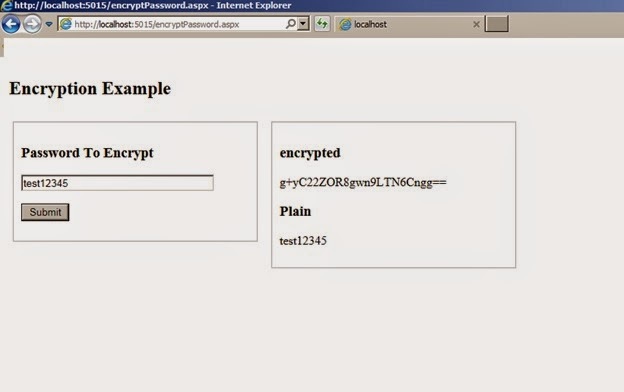 Sharing you the simple method which is using the MD5 algorithm to encrypt the password and any provided string. MD5CryptoServiceProvider class return the hash as an array of 16 bytes. Example computes the MD5 hash value of a string and returns the hash value in hexadecimal-formatted string. MD5 is the base class and it's abstract which is using by MD5CryptoServiceProvider . And there usingine TripleDESCryptoServiceProvider which is using the triple des algorithm. TripleDESCryptoServiceProvider class is used to encrypt/ decrypt keys which in turn uses 3DES (Triple Data Encryption Standard) algorithm.